Dr. Durga Devarakonda provides restorative dentistry to patients in need of tooth repair or replacement. She has experience in all facets of restorative dentistry including endodontics, periodontics, and prosthodontics, and can work wonders restoring the form and function of your teeth. Dr. Durga Devarakonda, restorative dentist, has a lot of experience in repairing/replacing damaged teeth with porcelain crowns and bridges. She uses a bridge to replace a missing tooth or teeth by anchoring to neighboring teeth on either side. If you have missing teeth, dental bridges may be the ideal procedure to help return your smile to its youthful beauty. In addition to filling gaps, a dental bridge can also be used to correct speaking and chewing problems, and increase strength when biting. Crowns and fixed bridges do not require any special maintenance techniques after they’re applied — simply brush and floss like you’re used to, concentrating on the area at the base of your restoration, especially. Do take care when flossing near your crown or bridge, working the floss through the teeth rather than moving quickly up and down. Contact Carrollton based Restorative Dentist Dr. Durga if you are experiencing pain when chewing, strain when biting or have difficulty speaking because of misaligned or missing teeth –a dental bridge might be the perfect option for you. Dr. Durga offers both partial dentures (to replace a small section of teeth and help prevent existing healthy, natural teeth from shifting position) and full or complete dentures (to replace an entire set of teeth, such as upper and lower dentures). 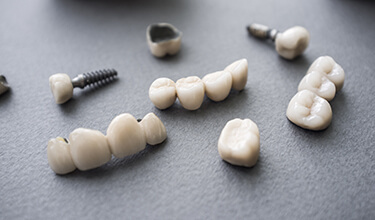 Partial and full dentures offer an efficient, affordable option in tooth replacement for patients who are short on time or who wish for the lowest-cost. Dentures restore the function of your teeth, the appearance of your smile and can correct facial features affected by missing teeth. 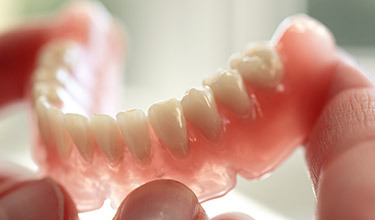 Dentures are designed to replace missing teeth and are worn by millions of people all across the world. Prosthetic teeth attached to a gum colored base, most dentures are made from a combination of metals and synthetic material, are light weight and long lasting and they mimic the look and feel of natural teeth. 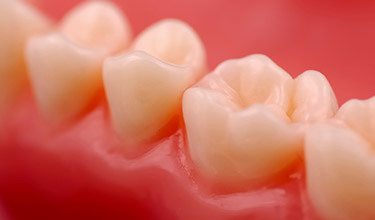 With proper care and maintenance, partial and full dentures will need to be replaced every five to seven years. Dr. Durga offers tooth colored fillings that blend with the surrounding tooth color and are easy to apply usually in a single visit. They can prevent cold and hot sensitivity and biting pain. The resin in these fillings prevents bacteria from attacking the tooth. You can show off your perfectly blended tooth-colored fillings with a confident and beautiful smile. For years, the silver-mercury amalgam has been the standard filling material used in dental practices. Even though they are effective and affordable, they do not have the natural look. We also offer modern, state-of-the-art fillings that are a natural-looking white, contain no metals, and can actually strengthen your teeth. 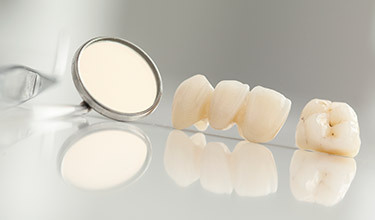 The biggest reason many of our patients are choosing the white bonded fillings is the way they look — nearly invisible, compared to the metal filling. They also bond tightly with the healthy part of the tooth to decrease the chance of future decay. We perform various types of tooth extractions including wisdom teeth, also called the third molars. It may be necessary to extract wisdom teeth, for example, if they grow sideways imposing pressure on the adjacent teeth, become trapped under the gum, become infected, or undergo decay. A simple extraction is performed when the tooth is intact and has partially erupted, or is visible outside of the gum line. This method does not require a scalpel or sutures, and the recovery period is generally short. 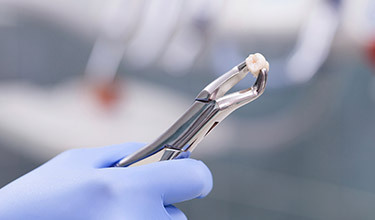 A surgical extraction is used most often with the wisdom teeth, and requires the use of a scalpel. Dr. Durga opens the gum line and removes any bone or tissue covering the tooth. The gum is then stitched closed. Most wisdom teeth surgeries take less than an hour and can be done in our office. Before removing your wisdom teeth, we will explain every step of the procedure and answer any questions you have. Dr. Durga offers endodontic therapy or root canals to patients with infected/damaged teeth. This procedure is painless and is recommended over removal of a tooth. It consists of removing the tooth's pulp and cleaning the infected tissue and nerve. The overall procedure is usually done in one or two visits. During the first visit, we remove the infected pulp, clean the chamber and use medication to eliminate all bacteria. If the infection has been eliminated, we seal the tooth in the same visit or if needed the second visit with gutta-percha, which prevents bacteria from getting to the root of the tooth again. Because a tooth has no pulp to nourish it after a root canal, it is recommended that a crown be fitted so the structure of the tooth is not compromised and its appearance remains the same.